The air is getting colder and the days are getting shorter, signalling the beginning of hockey season. 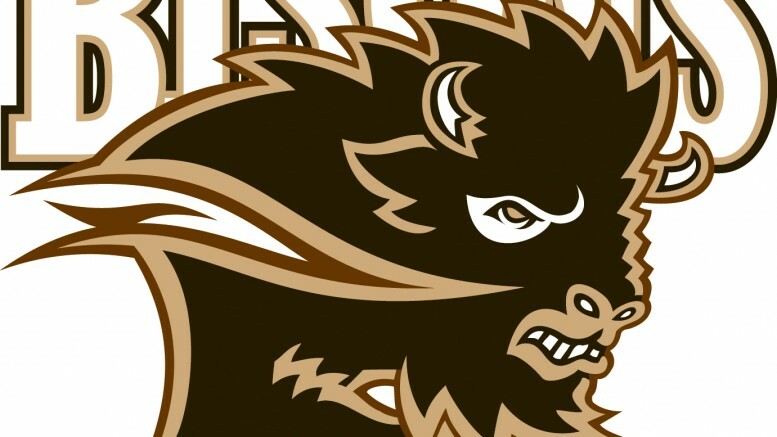 The Bisons men’s hockey team have already started training camp, and there is plenty to look forward to this year. Manitoba announced eight new recruits for the 2015-16 Canada West season. Forwards Liam Bilton, Jordyn Boyd, Brett Brooks, Brett Stovin, and Jonah Wasylak, goaltenders Justin Paulic and Dasan Sydora, and defenceman Adam Henry will all be joining the herd this year. Head coach Mike Sirant talked to the Manitoban about this year’s recruiting class and the quality of the players coming into the Bison program. Last Tuesday, Sirant introduced two of the eight rookies for 2015-16, Liam Bilton and Brett Stovin at a press conference. Stovin is a 20-year-old local player from Stony Mountain. He spent five seasons in the WHL with the Saskatoon Blades and even had an eight-game stint with the Missouri Mavericks of the East Coast Hockey League, where he scored five goals and added one assist. “I’ve spent the last two seasons being a leader on a team that was rebuilding, getting a lot of ice time and getting an opportunity to play a lot more offensively whereas in the past with the Blades I’ve been a defensive player, playing in a tough role,” Stovin said. Bilton played three seasons with the Winnipeg Blues and his coming off his best campaign last year, when he scored 52 points in 55 games. The six-foot-four winger from Winnipeg is ready for this season and said he did a lot of intense training in the off-season to prepare. Manitoba’s six other recruits, who weren’t in attendance, also have their fair share of on-ice experience to lend to the Bisons. Boyd, hailing from Winnipeg, has played for the Everett Silvertips and Kootenay Ice in the WHL and the Portage Terriers in the Manitoba Junior Hockey Leage (MJHL). He’s fresh off an RBC Championship this past season with the Terriers and has proven to be a playoff performer, notching 17 points in 12 playoff games in 2015. Brooks spent last season playing for the Winnipeg Blues in the MJHL, contributing 62 points in 58 games in the regular season. The six-foot, 190-pound forward has spent time with the Moose Jaw Warriors in the WHL as well. Wasyluk is a big six-foot-three forward with an eye for the net. The Calgary native recorded career high totals last season with the MJHL’s Steinbach Pistons, adding 48 points in 60 regular season games. Paulic is one of two goalie recruits for the Bisons. Hailing from Thompson, he split three seasons in the WHL with the Moose Jaw Warriors and the Victoria Royals. His best season came in 2012-13 when he posted a 3.15 goals-against average (GAA), and a 0.899 save percentage. Sydora rounds out the goalie recruits. The five-foot-nine, 165-pound native of Red Deer, Alta., played last season with the Winkler Flyers of the MJHL. He put up solid numbers, with a 0.921 save percentage and a 2.60 GAA. Henry has spent four seasons in the WHL, suiting up for the Lethbridge Hurricanes, Seattle Thunderbirds, Saskatoon Blades and most recently the Portland Winterhawks. The journeyman finished off his WHL career with 115 points in 238 games. The herd heads to Saskatchewan on the weekend of Sept. 18-20, where they will play against Regina at Ochapowace First Nation on Friday and then travel to Regina to play Calgary on Saturday.